The University of California regents met at UCLA on Sept. 14 and 15, where the 26 voting members on the governing board of the UC system discussed the future of the UC system in the face of the upcoming election, state growth and tuition increases. 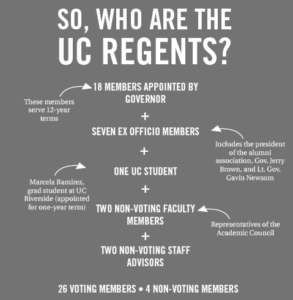 The regents are the governing board of the UC system, making them not only responsible for awarding diplomas but also for determining the future and focus of the entire university system — here are the highlights from the most recent meeting. During the Sept. 14 meeting, the Academic and Student Affairs Committee discussed seven of the 13 academic elements of the 2015-16 budget framework — with main focuses on improving the university’s commitment to transfer students, promoting innovations to support student progress and advancing the use of technology and data to enhance student success. UC Office of the President, Provost and Executive Vice President Aimée Dorr said the new transfer pathway, a program that outlines a single set of courses needed for your major to enroll at the UC, “is a great success story” but said there is a lot of work still needed to be done. 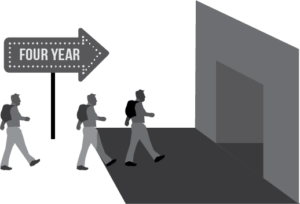 Currently, the 2017-18 goal of two freshman for every one transfer student was achieved by three campuses, with UC Berkeley right on the cusp. UC Santa Cruz, however, currently has a 4.3:1.1 ratio. Regent Eloy Oakley, who works as Superintendent and President of Long Beach City College, said California Community Colleges (CCCs) would benefit from a larger discussion on pathway courses to ensure a stronger connection between the UC and CCCs, similar to the UC’s connection to California State Universities (CSUs), which is a more streamlined process to transfer between CSUs and UCs. Oakley also stressed the importance of encouraging CCC students to apply to the UC and think beyond the scope of CCCs. With the election weeks away, the regents discussed the impacts future propositions could have on the UC within their newly formed Public Engagement and Development (PED) Committee — a new committee aimed at expanding education across all spectrums, not just in the classroom. The UC Board of Regents does not collectively endorse propositions often, so last week they just addressed, not endorsed, the measures that may directly affect the UC’s students and operations. Prop 56, which has a 59 percent chance of passing according to a poll from The Mercury News, would increase the cigarette tax by $2, with the funds mostly padding existing healthcare programs. The tax would also provide $40 million to create a new state-run program to increase the number of primary care and emergency physicians being trained. Since the UC trains physicians, the university could potentially receive funding for training. The PED Committee also discussed Prop 64, the legalization of the recreational use of marijuana for those 21 years or older. “I think the important thing for us is we can still regulate it on campuses through existing policies,” said UC Senior Vice President for Government Relations Nelson Peacock to the PED committee. While voters will be deciding whether or not marijuana should be legalized in California, since the UC is a federally funded public institution the UC and UCSC must abide by federal laws around marijuana legalization. Regardless if Prop 64 passes, marijuana will remain illegal on all UC campuses. Lt. Gov. Gavin Newsom, an ex officio member of the regents and a proponent of the legalization of marijuana, said at the meeting that $20 million from the tax revenue on the drug will be set aside for UC San Diego’s cannabis research center. However, despite Newsom’s claim, the wording of the proposition allocates $2 million annually to the research center with no cap date. By the figure of $20 million Newsom extrapolated ten years out. This was in conjunction with the other provision which allocates $10 million in research grants each year over the next 11 years. These grants are open to UC researchers. “We drafted [Prop 64] with the UC in mind,” Newsom said in the regents meeting. Newsom also informed the committee about the specifics of Prop 63, an initiative that would treat ammunition like gun sales — requiring background checks and prohibiting the possession of large capacity ammunition magazines. It would also relinquish the assault rifles of felons at sentencing rather than once they return from prison. The UC commitment to enroll 5,000 more students across the UC system for the next three years has led to the most diverse UC population in history— especially on UCSC’s campus. UCSC media relations director, Scott Hernandez-Jason said some of UCSC’s historically underrepresented groups grew from last year. In an effort to mediate the less than 2 percent representation of Afrikan, Black and Caribbean (ABC) students on campus, UCSC enrolled 63 more ABC students than last year. Likewise, admissions enrolled 20 more students who self-identified as American Indian/Alaskan Native and 156 more Latinx identifying students. In alignment with UC President Janet Napolitano’s mandated 5,000 increase in student enrollment over the next three years, 500 additional students were enrolled at UCSC this year. The enrollment increase has also led to an increase in Californian students at UCSC with 3,800 undergraduates and 1,075 transfers from California. The UC regents ended their weekend looking at the future of California and the shifts in the state’s demographic impact on the UC. UC Executive Vice President Aimée Dorr said by 2040, California’s population will grow by about 11 million people and about half of all college-age people will be Latinx. She also highlighted the aging population of California and stressed that as baby boomers retire, it will leave a hole in the workforce that requires college degrees. “With a larger population, Californians of tomorrow will need more of our graduates,” Dorr said.